With its focus on “Moving Communities”, the 2017 Idea Camp followed an open call for daring ideas to build societies with greater equality, sustainability and solidarity, and a stronger sense of social justice. It is about communities on the move, communities in flux and also the power of people to “move” their communities through their progressive and creative ideas. The 2017 Idea Camp brought together 50 Idea Makers from 24 countries across Europe and its neighbouring regions. During three days, participants nurtured and up-skilled their ideas with the ambition to counteract anti-democratic practices and bring forward voices excluded from public debate and decision-making. They worked with the support of a group of guest Idea Feeders, and Facilitators– the Hubs in the Connected Action for the Commons. The programme is articulated through a number of activities, including workshops facilitated by local collectives and the Idea Camp team, idea development sessions, walks in the neighbourhood, collective discussions, meetings with local organisations. In conjunction with the Idea Camp 2017, the City of Madrid, the European Cultural Foundation and the Connected Action for the Commons organised the Innovative City Development meeting with municipal and city officials who are working in a progressive approach on cultural and urban related issues, using participatory methods. Attendees from Poland, Spain, Greece, Moldova will co-exchange about the city as commons and also meet with the Idea Makers. The 2017 Idea Camp is inspired by three approaches to the theme of Moving Communities: exploring hope and radical positive possibilities for a future across borders; creating dialogue and exchange through grassroots initiatives and institutions; and bridging the potentials of the digital sphere with open knowledge and experiences. The concept of “safe crossings” is at the core of the visual identity and content of this Idea Camp. In these challenging times, we are eager to cultivate the Idea Camp community as a collective effort to move away from walls towards bridges, to create solidarity against neoliberal individualism, to nurture social and cultural initiatives as radical resistance to anti-democratic and oppressive practices. 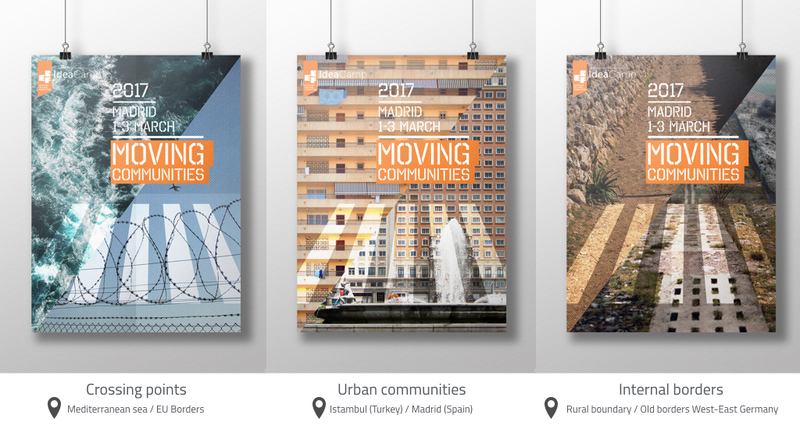 Madrid is a particularly inspiring location to explore the potential of positive, local, social and cultural initiatives. The City of Madrid, co-producer of the 2017 Idea Camp alongside the initiator of the encounter – the European Cultural Foundation – is one of the main European hubs of participatory democracy and citizen-led culture. Madrid Cultura Abierta (Madrid Open Culture) is the city’s new cultural public policy, bringing together and showcasing municipal and independent cultural events and providing access to shared knowledge and information. Over the last few years, the city has also been a national connecting point for citizen participation in local government and institutions, and a European hub for the municipalities movement. In keeping with Platoniq’s ethos of bridging cultural and digital innovation, this year we created a DataCamp for all Idea Makers and participants to connect and keep track of the development of their ideas. This Digital Roadbook will be a starting point for the development of a community of practice that will collaborate to create locally embedded alternatives before, during and after the 2017 Idea Camp. Bringing together the local, national and international dimension was a key goal for the development of this third edition of the Idea Camp. We are particularly proud of having created a unique encounter between Madrid’s local fabric, Spanish and European progressive institutions and an international community of innovative social change initiatives. 1. Idea Makers work on identifying their beneficiary communities and their own role in these. Where they do not form part of the such community, this Step will get them thinking about the importance of involving beneficiaries in the design of their project. 2. Their understanding of the beneficiaries of their project becomes increasingly multilayered. with them and why they are engaging with beneficiaries.